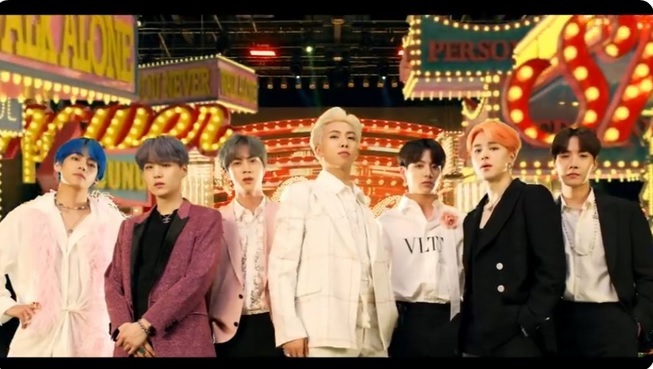 The latest BTS’ song “Boy with Luv” has broken the record as the fastest MV on YouTube’s history to reach 50 million views after only less than 15 hours after its release. At this pace, this BTS-Halsey collaboration is expected to break the record too as the most viewed YouTube video in 24 hours. The current record is held at more than 56 million views. The album itself, “Map of the Soul Persona” has more than 3 million units sold on Amazon, and is ranked #1 on Spotify in over 83 countries as well, and will continue to dominate in more countries as the day progresses. It has only been less than 24 hours but BTS’ new album has been breaking existing records already. The Bangtan Boys will be the musical guest on the famous American TV show, Saturday Night Live (SNL) this weekend. Watch the BTS song that has captivated music fans all around the world. Video is courtesy of BigHit Entertainment. The final number of views for BTS’ “Boy in Luv” is a staggering 78, 052, 562 million. This is a new record for the Bangtan Boys. The fastest MV to gain more than 70 M views within a 24-hour period. The YouTube record of BTS started from 24,000 for their debut single, “No More Dream”, and the views of their succeeding MVs steadily increased. “Idol” was their first MV to break the record on YouTube for the Most Viewed MV in 24 hours- with 45.9 million views in 24 hours. And now, they have set a new phenomenal record – 78,000 views within 24 hours.